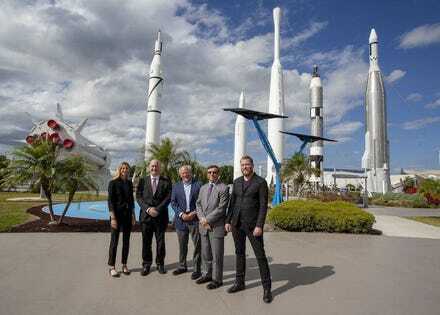 ISU-FIT team at the KSC Rocket Garden: Alex Colutrup (ISU-CSE Grad Student), Christian Sallaberger (ISU Board Chair), Andrew Aldrin (ISU-CSE Director), Dwayne McCay (Florida Tech President) and Chad Anderson (Space Angels CEO). I’m excited to be teaching a course in Space Entrepreneurship for the new ISU Center for Space Entrepreneurship at Florida’s Kennedy Space Center Vistor Complex this summer. Being out at KSC with the Florida Tech and International Space University team behind the endevour got me thinking about the growing need for the sort of students that ISU graduates and what an amazing impact they have had on my favorite industry. Commercial space startups are now far and away the fastest growing sector of the aerospace industry. According to Bryce Technologies, the five year period from 2013-2018 witnessed an order of magnitude increase in seed and venture capital investment. Space Angels Network reports that over $3 billion was invested in 2018 alone and cummulative commercial space investment is now at $18 billion. (http://bit.ly/2KBsRuX; Morgan Stanley, Goldman Sachs, Deloitte and Bank of America all project a space ecomony in the trillions. The array of innovative technologies and creative business plans is quite literally astronomical. But if any principle in the investment community can be called “axiomatic”, it is that investors place their bets on the people, not on technologies or business plans. Technologies-market fit is notoriously difficult to get right and business plans are just always wrong the frist time. Only a great team can overcome these unavoidable problems and save an investment from catastrophe. In popular investment categories like smartphone apps (actually a far smaller market than the space business today) our universities pour out thousands of talented engineers and business graduates. Space is harder. There are, of course, many great aerospace schools including the one at my university, and they produce well educated engineers ready to take seats in existing companies. However, finding well rounded business leaders with a broad understanding of the space domain is entirely another matter. The International Space University (ISU) was founded in 1987 by Peter Diamandis, Todd Hawley and Bob Richards. The founders were captivated by the vision that the future in space would be propelled by a non-traditional educational program stressing international, intercultural, and interdisciplinary programs and activities. They underlying theme to all programs at ISU has always been promoting a paradigm shift to a commercially dominated space ecosystem. Today, that paradigm shift is happening. Delft (The Netherlands). Next year’s SSP will be in Shenzhen, China. ISU curricullum isn’t quite orbital velocity, but it moves quickly. We are talking 24hrs a day of space, space, and more space for 9 weeks. The most notable contribution of ISU has been the network of alumni in space industry. Since its inception, ISU has populated global aerospace companies with 4,600 alumni. Many have literally ascended to positions of leadership and several have risen to the status of astronaut. A number of the most successful space startups are run by ISU alumni. For instance, Will Pomerantz graduated from ISU with a masters degree and secured a job as Director Space Prizes for the X-Prize Foundation. While there he worked to establish the Google Lunar X Prize, which spurred this years’ inspirational Beresheet lunar mission. Pomerantz then became one of Richard Branson’s first hires at Virgin Galactic and was intsturmental in founding Virgin Orbit, which will be launching small satellites from a specially converted 747. In his spare time Will teamed with former NASA Deputy Admin Lori Garver, a lectuer for ISU, and Cassie Lee to found the Brooke Ownes Fellowship. Brook Owens is a successful non-profit assisting young women move forward in the aerospace industry with the help of top level mentors. This is one example of how the ISU alumi network is among the most effective associations in aerospace today. In 2016, ISU moved to create a permanent presence in the United States, ultimately selecting the Florida Institute of Technology to establish the ISU Center for Space Entrepreneurship at Florida Tech (ISU-CSE). The program will begin operation this year offering a Graduate Certificate in Commercial Space Studies. The ISU-CSE program is intended to dovetail with masters-level programs from a variety of globally recognized universities with programs in engineering, business and entrepreneurship. All courses are fully accredited, and will contribute to existing FIT degree programs in business and engineering. The vision of the program is pure ISU. Gather space thought leaders with inspired students to create the next generation of space leaders, space visionaries. ISU began with a vision of creating a new kind of education dedicated to the advancement of space exploration and development, and the creation of a cohesive community of space advocates. That vision continues today and will be an important element in developing the talent necessary for the acceleration of the commercial space revolution. Like the ISU SSP, ISU-CSE will involve students faculty and mentors in Team Projects. The difference in this case is that students will be building real businesses. While they will receive academic grades, the real degree will be conferred by the market. At the conclusion of their Commercial Space Programs (CSP) graduate certificate, students will be graded on investability from the Space Angels Network. This is real-world learning at its best. The CSP program will be conducted at the historic Kennedy Space Center, in the Visitor Complex. I’ve spent a bit of time out there and it’s always an inspiring educational location where you can expect to see big things happen including a space launch or three! With a projected launch manifest of over 20 launches from Florida this year, there will be plenty of occasions to not only get an up close and personal view of the launches. KSC is also the gateway to space and at the center of a commercial space hub emerging on the Space Coast. Students and faculty will also have the opportunity to network with the leaders of space industry who come to the Space Coast for every launch. I hope to see some of you there!